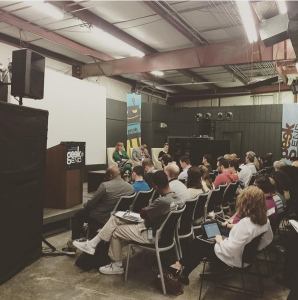 We recently attended Geekend, the awesome annual interactive conference that takes place in Savannah, GA.
It’s a weekend full of engaging presentations, panels and workshops on innovation in the tech and digital worlds. This year, the topics covered ranged from virtual reality to healthcare to selfie sticks. In fact, the range of topics was quite possibly our favorite part of the whole shindig – it made the conference welcoming to creatives from all walks of life so you could easily explore new ideas and get to see what everyone is excited about in their field. We would be lying if we didn’t admit that getting on the stage with some smart people to discuss things we care about was one of our highlights of Geekend. Katheriin from Fleep was a part of the panel discussion “What’s beyond email” – talking about what’s wrong with email (hint: a lot), and how to move beyond email - with Kevin Lawver (Planted), Josh Nichols (Github) and Steve Ross (Oak.Works). Now this was an engaging session. Ben explained and ran the audience through several design gaming techniques, to help anyone (!) think outside the box and come up with creative ideas. The 2-hour workshop may have looked daunting on the schedule but was in fact the most fun one! You can have a sneak peek of everything Ben had to share from his slide deck. People had traveled from all over to Geekend, but we especially loved seeing how diverse and talented the creative community of Savannah is! This Southern town is known for its parks and architecture, and has a reputation for being a party town (even the passport control official at JFK airport welcomed us by asking if we were going to “party it down” in Savannah) – there’s really much more to it. Among other creatives, Savannah is home to Aetho (recently launched Aeon that makes your GoPro footage look like it’s shot by a Hollywood director), the team behind the recent redesign of 500px, the prime business jet company Gulfstream, the top art & design college SCAD, and the town even has its own makerspace. Naturally, all of the aforementioned were also represented at Geekend. 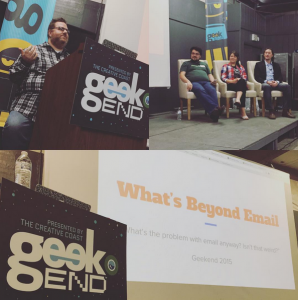 Thanks for a great conference, Geekend! Thanks for the Southern hospitality, Savannah!